Lately I have been living in jeans, so as soon as I saw these beauts I just had to own. Since becoming a Mumma I find that sometimes it is more about comfort than style.....JOKES! Be it nursery, work or the weekly food shop, I love to dress up! In the famous words of CoCo Chanel 'Dress shabbily and they remember the dress; dress impeccably and they remember the woman.' I think she was on to something there! 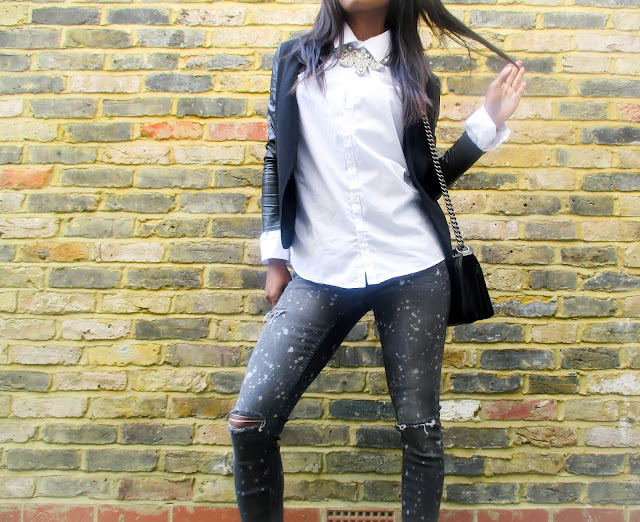 I snapped these new jeans in my all time fav place, Zara at a bargain of £39.99. As soon as I saw them I loved them, I love the mid rise cut of the jean, don't get me wrong I love a high waisted pair too, as it holds you all in all the right places and can elongate you! But what really caught my eye about these jeans is the length, it sort of preps you for Spring being cut above the ankle even thought it is freezing out! The jeans are frayed at the bottom which I really like as it adds a different element to it. 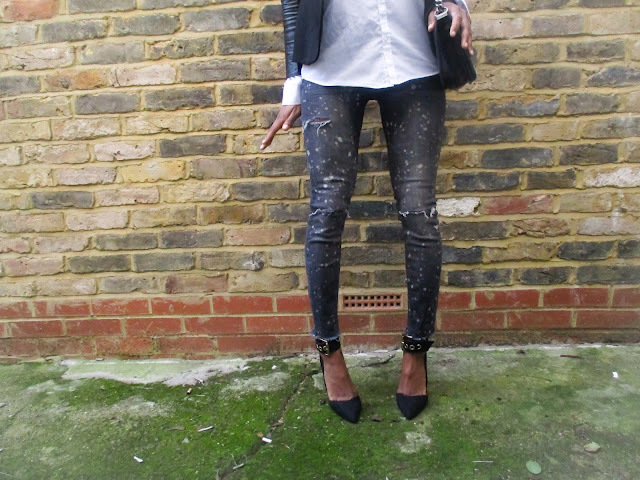 I teamed the jeans up with a mans fitted white shirt, which I actually bought when pregnant with Leanora, along with the black blazer with faux leather arms, which is also another golden oldie purchase from my preggers days, both purchased from H&M. These amazing super comfy shoes which I purchased last year from ASOS, here are a similar pair teamed with my Chanel LeBoy bag and River Island sunglasses. This was a perfect look for having dinner with my sis. Makeup on, card and keys in my bag, off I set for our girly dinner. Are you a jean junkie, what do you think of the ankle grazer? Love love this look! It's elegant, trendy, chic and above all comfy! Great job styling the outfit! Very cute! I especially like the necklace outside the collar. Chic!